Custom acrylic jewelry can be that perfect touch you’ve been looking for to finish an outfit, bridal party ensemble, or gift. Personalized jewelry is a great gift regardless of the occasion – even no occasion at all! A monogrammed acrylic necklace can be a classic addition to your jewelry collection and we have a wide selection you need to find and create the perfect one to match your personality and style. 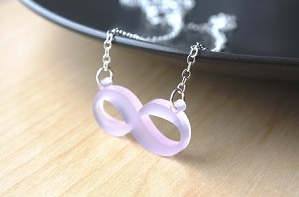 In a range of colors, finishes and fonts, our acrylic jewelry can be tailored to everyone’s style and taste. Whether you are looking to match a bridal color or use the favorite colors of the recipients, our selection is unmatched by other websites and stores. With every color in the rainbow including metallic, glitter and fluorescent, you may have a hard time deciding! We offer fashion designs and monograms in all types of different fonts making shopping and custom designing fun! Whether you’re searching for an acrylic necklace or a personalized photo frame, we have just what you need to create the perfect gift. Our acrylic jewelry includes necklaces, bracelets and earrings, all ready for your custom touch. Choose the colors, finishes, fonts, and designs to create a one of a kind piece that you or anyone will enjoy for years. Find the perfect jewelry for bridesmaid gifts, birthdays, special occasions and more with the help of Frederick Engraving. You’ll find everything you need in one spot without driving all over town trying to find the ideal gifts for those you love!